The BTD-350 Thunderstorm Detector is a standalone sensor that reliably detects the presence of all forms of lightning to a range of 83km. The unique quasi electrostatic operating principle gives the detector a very low false alarm rate and the ability to warn of the risk of overhead lightning. The ability to reliably detect and range cloud-to-cloud lightning, which is typically much more common than cloud-to-ground strikes, makes the BTD-350 much more sensitive to the presence of storms compared to devices that rely on radio detection. The electrostatic operating principle allows the sensor to warn of the risk of overhead lightning before the first discharge occurs. Virtually maintenance free in operation, the BTD-350 can either interface directly to an integrated system or be operated using the supplied PC compatible display and logging software. The optional warning relay module allows the sensor to automatically sound alarms whenever a storm approaches. 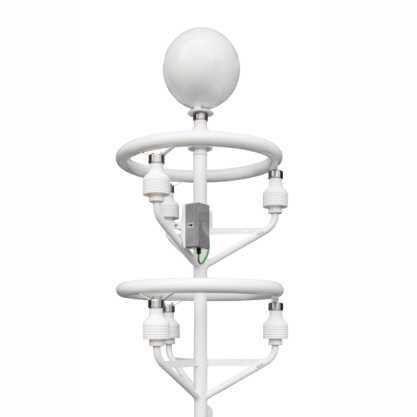 The Biral Thunderstorm Detector BTD-350 is a standalone sensor providing real-time detection and ranging of thunderstorm activity within 45 nautical miles (83km). The sensor bases thunderstorm warnings on the detection and range of lightning flashes throughout the detection area, as well as the presence of strong electric fields and electrically charged precipitation occurring at the installation site. Strong electric fields and charged precipitation provide the ability to warn of the potential for nearby lightning activity before the occurrence of the first flash, with the subsequent flashes used for thunderstorm intensity and proximity monitoring. Lightning flashes of all types (cloud-to-ground, cloud-to-cloud and intra-cloud) and polarities are detected, ranged and logged within 2 seconds of their initiation. Electric field disturbances associated with potential overhead thunderstorm development produce an alert after 5 seconds of monitoring. 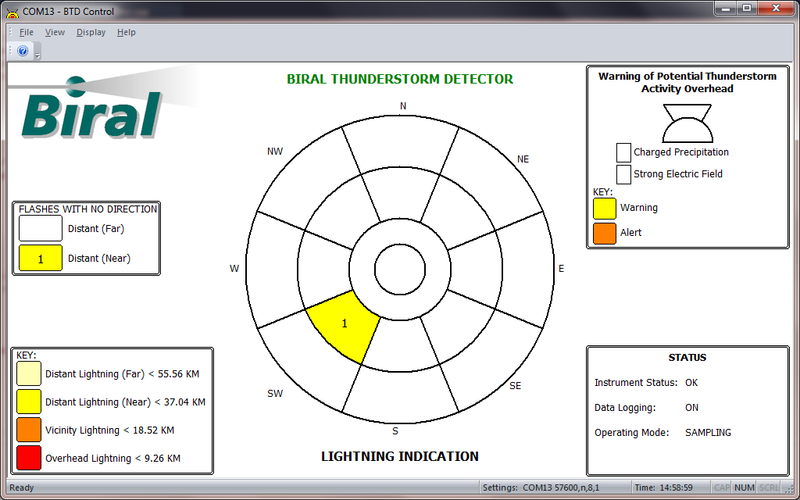 Such sensitivity and rapid alerts allow the greatest warning time of local thunderstorm development for the user, with the unique monitoring techniques providing an extremely low false alarm rate. 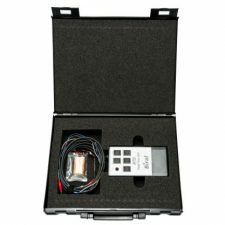 The operating principle of the BTD-350 is based upon sensing changes in the atmospheric electric field in the frequency band of 1-47 Hz. Such low frequency means that the sensor is most sensitive to slow-varying electrostatic fields associated with charge transfer from lightning flashes, nearby corona (point) discharge and the turbulent movement of strongly-charged aerosol associated with thunderstorm activity. In addition, charge transferred to the antennas by precipitation is analysed and used to determine whether the overhead cloud has the potential for thunderstorm activity. Radio emissions (both natural and man-made) are associated with considerably higher frequencies so do not produce interference on the sensor. Noise associated with mains power distribution (typically 50 or 60 Hz and harmonics) are removed by both analogue and digital filtering. The range information supplied by the sensor can be augmented with a Direction Finder module. The Direction Finder module detects electromagnetic waves produced by lightning discharges in a band from approximately 3kHZ to 1MHz. The direction from sensor to discharge is reported to the nearest degree in the BTD-350 data output. The BTD-350 can be configured for either Ethernet or RS422 serial communication. The data is output as an ASCII coded data string for easy integration with other data processing systems. For standalone use a comprehensive PC compatible software application is supplied which provides data visualisation, sensor control and data logging. 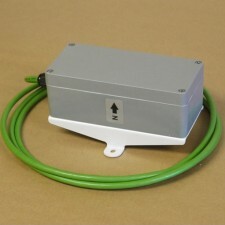 A relay output module is available to allow the direct switching of warning devices such as sounders and beacons. 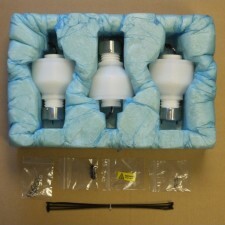 Three relays are provided to cover the warning and alert status of the sensor. The free BTD-300 Archive Plotter Software allows you to easily visualise and plot the output data. The software and manual can be downloaded using the links below. Full instructions for installing and using the software are provided in the manual.